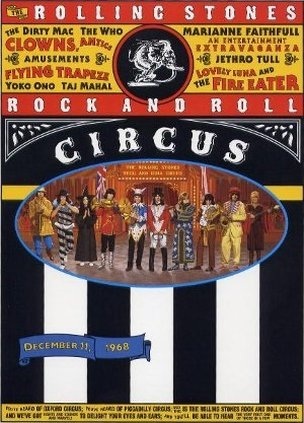 In December 1968, the Rolling Stones staged an expensive, in-studio extravaganza: The Rock and Roll Circus. The Who were definitely there. Reportedly conceived at a cost of tens of thousands of pounds, the Stones reserved Intertel Studios in Wembley, northwest of London, for two days of rehearsals and live performances, on 10th and 11th December. Besides The Who, musical acts included Taj Mahal, Marianne Faithful and Jethro Tull. John Lennon and Yoko Ono fronted the supergroup The Dirty Mac with Eric Clapton, Mitch Mitchell and Keith Richards. And, of course the Stones played the finale. But it wasn't just a musical circus: The studio was decked out with real, costumed carnival performers and aerial acts. However, technical problems plagued production throughout live filming on the 11th. The musical headliners didn't begin until mid-afternoon. The Stones fans in attendance, waiting for their heroes to play the finale, dwindled as the day wore on. Eventually, the event stretched into the next morning before it was finally wrapped. Amid the sawdust, the finely-tuned Who came off their second straight year of worldwide touring to blister three takes of "A Quick One (While He's Away)." The tired performers and technical problems didn't help, but it's possible The Who's raw, road-sharpened power helped convinced the Stones to shelve the project. A DVD was finally released in 1996. But before that, all the world knew of the Circus was one of the incredible iterations of "A Quick One," released in 1979 thanks to Jeff Stein's "The Kids Are Alright." And now, thanks to the archives of photographers present for the event, you can enjoy more magic Who moments from this special '60s studio event by clicking through the slideshow below.